LAS VEGAS. 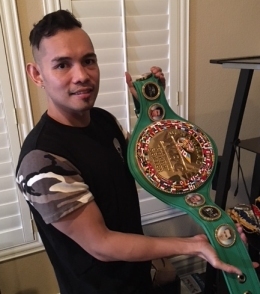 WBC diamond and “super” WBA bantamweight champion Nonito Donaire, Jr. is two wins away from claiming recognition as the undisputed 118-pound king, a feat that’s unprecedented in Philippine boxing history, and the next step is to beat WBO titlist Zolani Tete of South Africa, tentatively in Los Angeles in April. No Filipino has ever gained undisputed status, meaning concurrent recognition as WBA, WBC, IBF and WBO champion in a weight division. Donaire, 36, is already in the record books as the first fighter ever to drop down two weight classes in winning a world championship. The Filipino Flash went from featherweight to bantamweight to dethrone WBA titleholder Ryan Burnett via a fourth round retirement in Glasgow last November. It was Donaire’s first rung in the World Boxing Series Series (WBSS) ladder to reach undisputed status. The hitch is newly-minted WBC bantamweight titleholder Nordine Oubaali of France isn't in the WBSS competition so the eventual winner will be recognized only by the WBA, IBF and WBO, falling short of the undisputed status. However, the WBSS insists in calling the ultimate survivor in the series the undisputed champion. Tete, 30, beat Russia’s Mikhail Aloyan on points in his first move up the WBSS ladder last October. The winner of the Donaire-Tete bout will advance to battle the survivor of the other WBSS pairing between Japan’s Naoya Inoue and Puerto Rico’s Emmanuel Rodriguez for the undisputed crown. In other previous WBSS encounters, Inoue disposed of the Dominican Republic’s Juan Carlos Payano in one round while Rodriguez outpointed Australia’s Jason Moloney on a split verdict. Inoue holds the “regular” version of the WBA title (Donaire is the “super” WBA champion) and Rodriguez wears the IBF strap. “I think Tete is easier to beat than Burnett,” said Donaire. “I’ve studied his style on film. It’s not like Burnett who was hard to figure out because of his style. I’m confident of beating Tete and going all the way to become the undisputed bantamweight champion.” Former US Olympic boxing coach Kenny Adams, who made his debut in Donaire’s corner in Glasgow, will be back with the team for the Tete fight. Donaire said the plan is to stage his fight against Tete and the Inoue-Rodriguez bout on the same card at the Staples Center in Los Angeles. “It makes sense because right after both fights, WBSS can do a press conference to announce the final between the two winners,” he said. Photo: Nonito Donaire, Jr. shows off his newly-acquired WBC diamond bantamweight title belt.